Ensure Drink Side Effects Exposed - This May Shock You! Ensure is a brand by Abbott that makes medical “nutritional shakes and drinks.”It makes big claims to customers such as “#1 Doctor Recommended” and “Worldwide Leader in Nutritional Science” but in reality, their products are as far away from a healthy meal as you can get. Sadly, these products are often given to patients in extremely poor health, who need proper nutrition the most. Instead, when consuming these products they are receiving the following: preservatives, fillers, and chemicals. 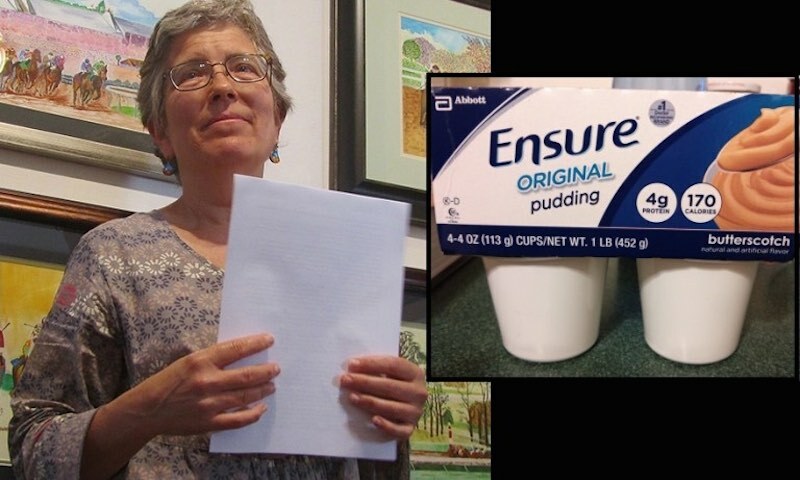 I read this Terminal Hospice Patient Exposes Truth About Ensure “Nutrition” Drinks – I was impressed by the ladies comment. I see people at Kroger purchase this stuff by the cart load. I guess they don’t know of the dangers there putting in their mouths. One thing I notice about this stuff that it is expensive, from $6.00 a six pack to now over 15.00 a six pack now. They are also getting rich off this stuff. So sad indeed. If science can back Ensure products then I will just believe them over a lay person’s opinion. The name “Ensure” should ensure you that this is surely a sure goodly ensured product. It has lots of vitamins, just read the label on the back. Don’t you know it is against the law to falsify labeling or not list every ingredient on the label? … Just kidding. But this sadly is the thought pattern of many people. Oh my gosh, I sooo thought you were serious. You had me good at first….LOL ? Such a world of preservatives and additives we live in today huh….Be Well ?? The hospital gave this to me when I was being fed by a feeding tube and it was the absolute worst stuff that I ever had. I was supposed to be drinking it and regular milk shakes after the feeding tube came out, since I didn’t drink the amount they wanted they put a feeding tube down me again. My husband was dying of cancer and was unable to eat and was drinking ensure on a regular basis. I tasted it myself and it tasted very good. I think that’s why people like and drink it. I’m glad this article pointed out what an unhealthy product this truly is. When my dad was dying from cancer, he wanted Mom to buy him protein powder. I asked, “Why not just scramble up some eggs for him?” If you want protein as it’s meant to be ingested, look no further than a natural source like meat or eggs. Dad was able to eat so I started making him scrambled eggs and pudding from scratch. He was able to digest these a lot easier than a protein powder would have been digested. The protein powder may not have hurt him but it sure wouldn’t have helped him much either. i came out of hospital 3 months ago after an episode of severe dehydration, malnutrition and acute kidney injury. basically i nearly died and was given ensure plus in hospital with means and told i should have at least 2 daily to regain weight. because i assumed it was healthy, i did. i have been home 2 and a half months, still taking ensure and have never felt so ill in my life. i have gained weight but feel terrible, the worst thing is my previously healthy hair seems to be breaking/falling out/thinning at an alarming rate. i wonder if this has to do with the high level of protein in the drink which i’m told can be detrimental to hair? my mum had this fed through a tube in her stomach when she was in hospice with throat cancer. she has since died but i remember how her previously curly hair had become very straight (had never happened before) and thin. i think there is a lot more to this product than meets the eye, i have been taking it regularly but will stop today after reading this. any advice/reassurance that my hair will improve would be greatly appreciated as i’m going through enough in life without this. My late partner was prescribed this but fortunately did not partake of much of it. He did not partake of much at the end except some scramble egg and eventually just sips of water. That which was left after he died I placed in the rubbish and so it seems I did the right thing. This angers me! I thought I was getting what I needed from Ensure. I drink it when I’m sick from chemotherapy. I am so mad they give this to me at the cancer center and I buy it for at home. Oh my gosh I’m scared I drink it daily. Shame on them what can I drink to get the nutrition I need. if anyone knows please help me as I can’t eat a lot of days. Thank you. Hi Lori, I’m sorry to hear that you were given this when you were sick! Freshly-extracted juices or smoothies are best to get all the nutrients you need. Otherwise, there are many other liquids you can drink, such as herbal teas, mushroom or bone broths. Even adding 1 tablespoon of apple cider vinegar in your drink, drunk regularly, helps A LOT. Please explore this site as it gives you a very basic understanding about how your body works, how to detoxify the toxins from chemo and radiation, and how to nourish your body back to health! Take your own health into your own health by educating yourself. All the best and big hugs! Excellent response and recommendations. I drink squeezed lemon juice, vinegar, and orange juice daily. I would suggest, as the article says, soup. If you cannot tolerate ‘lumps’, then just broth is very nutritious. Look for an organic chicken broth with no preservatives – you can buy them in tetra packs or cans. Just heat and serve. Or even natural fruit/veggie drinks, as long as they are pure juice. Juice. Try juicing as an energy boost and vitamin/mineral suppliment. Home made broth can also help. Please look into shakeology. My girlfriend stands by it and I drink it daily and it is incredibly healthy. Have you researched shakeology, it is full of superfoods and vitamins. Non gmo, no fillers. Totally good for you. I’ve been making smoothies with equal parts kefir, and fruit; (banana, strawberries,blueberries or any other fruit you may enjoy) for my husband who is also on chemo. They taste good and the kefir is a good source of probiotics. You can find kefir in the yogurt section of your grocery either plain or fruit flavored. Real food will give you all that you need, will have appealing flavor, and be less expensive. If you are unable, someone can make a large pot of bone broth, nourishing, healing, and well tolerated. Juicing also, keep in mind fruit/vegie juice loses antioxidants in exposure to air. Store in vacuum-sealed environment. Making large amounts and freezing works well. If you can’t do this yourself, contact your church, most have a group that will be very happy to help. If you don’t belong to a church, contact any church. Many will help community members. There is no substitute for real, organic, healthy food. If you have a food processor at home you can try making a stew with some beef or chicken , beans and vegetables, put it through the food processor and make mini meals out of it. These can be eaten with a spoon. You can freeze some for another day, then heat it up on the stove, don’t use the microwave it turns your food into plastic. Feel better. Purée real foods instead of processed & packaged. Fresh and raw or steamed. The blender can mix up quickly and simple. I’m sorry you are ill it must be horrible. If there is one thing I’ve learnt it is this, if a nutritional supplement does not have the science to back it and the label has words that cannot be pronounced, do your research first before buying the product. Very often we learn the hard way and there may be times when ‘better late than never’ is not ‘better’, but when we do have the opportunity to build an awareness for ourselves that could help others as well … just do it! Lori Dickey I hope you will look into not eating sugar too as that is like putting gas on the fire. Also, I suggest The Truth about Cancer series. You can google it. God Bless. My 93 yr old daddy won’t eat food and this is the only thing we can get him to intake daily. He sometimes only gets 700 calories a day, IF he drinks 2 of them. I try for 3. Yes, it has ugly stuff in it but it is the only thing sustaining him!!! He won’t eat more than a few mouthfuls of pureed food, if even that so for him to “live” he needs some sustenance. No, he won’t take in broths and such as you have stated. Sometimes he will eat a bite of cake or cookie. So my dilemma is what to do???? Well, he is 93 and since he won’t partake of anything else to keep him alive, then he can have it. God is in control of his life and I pray for him to be with me a few more years! Hi Terry! Your post breaks my heart for your father! I could be wrong but it sounds like your father just loves chocolate! Even at 93, he knows what he likes lol. My advice to you would be to gather knowledge on how to make a chocolaty nutritional smoothie! This just came to mind so I don’t have any recommendations for you on types of foods but I would definitely do some research. I will too out of my own curiosities! Look for nutritious foods that u can blend together n hide in coco flavoring or a healthy chocolate! Maybe you could type into Google… Organic chocolate nutritional smoothie……I still have yet to try it ! I’m gonna do it now! Go to Whole Foods, Natural Grocers. They have drinks similar to this. One is Orgain. It is about $2 each .. but all of the junk is not in there. I have tasted a few, they taste as good as Ensure. Whole Foods is in bed with Monsanto. And they have also contributed millions to end true labeling practices. Hi Terry! My thoughts exactly. My mother just passed away 3 weeks ago from brain cancer. When she was dealing with chemo her whole pallet changed. She didn’t want meat or anything else she liked before let alone some puréed stew. It changed daily. When you are in a hospice situation, it doesn’t matter that things weren’t the healthiest. What mattered was getting calories in especially for someone who had problems swallowing. It helped her and she liked it. I do think they should try to find alternative ways of making it but it is so expensive as it is. Just another point of view. I am amazed at some of these comments and justification if why one gives this crap to loved ones knowing its bad. I could never do this crap to a loved one, let alone someone else’s either. I am glad I have signed a DNR, I am also thankful if I ever become ill, nobody is allowed to force this stuff on me and my son agrees with me. When it’s my time to go, I am going, I don’t want to be forced to prolong my passing. I will die peacefully at home, just as my grampa did and I’ll also let my mother die at home naturally as well. I would never do such things I’ve been reading. I totally agree regarding this horrible product which isn’t the only horrible one being marketed. Anyone reading the label can see all the sugar contained. Every cancer patient knows, or should know by now, that cancer thrives on sugar. Shame on the medical professionals who give this to their patients while in the “chemo chair”. Patient is getting double dose of poison .. chemo and sugar. By the way, I’m a “survivor”. This stuff may not be perfect but it isn’t as bad as the writer says… Far better to drink Ensure than to not get any nutrients… The hi protein shake has less “chemicals” but does have stuff you may need. In a perfect world a nutritionist would make meals that are perfect and organic and everything… But the real world this isn’t possible… Drink your shake.. won’t kill you. It may not kill you but it will make you so horribly uncomfortable you’ll wish you dead! It is as horrible as this author says. There is zero nutritional value in Ensure and it is very harmful. Mix up a banana with some raw kale or spinach and some carrot add some flax seed oil and fresh groung flax seeds and you have a healthy cheap natural drink that takes a couple of minutes to make. Puree some frozen spinach, add some coconut milk some olive or coconut oil, good salt and what ever spice you like, sprinkle with fresh ground flax seed or chia seeds and have a nice filling soup. Look, it may not be perfect, or even great, but it has its place. When I was getting chemo for ovarian cancer almost everything tasted foul. Let me be clear, not zero taste or a metallic taste, but foul, like wet cardboard. My husband and daughter tried to make protein shakes for me but the taste was still horrible and I just threw them up. They finally got me the high-protein chocolate shakes and I could drink them without throwing up. Every 3-4 hours someone would bring me a shake, and it was all I could eat. For almost 2 weeks after my IV and intraperitoneal chemo I was down and out, barely functioning. The third week I could get up and move around the house, and the 48 hours before my next treatment I took steroids (due to an anaphylactic response to the first chemo they tried). Those steroids got me moving a little more, and I could eat some tried and true foods that I knew wouldn’t make me sick. Mashed potatoes, chicken, and guacamole … that and my Ensure shakes were all I had for about 9 months. After my tumor debulking surgery I lost almost 60 pounds in 6 weeks and my oncologist told me if I lost anymore on my next visit I was going to need a feeding tube. I never drank Ensure before, nor have I had it since I finished chemo, but it served its purpose. Was it the optimal choice, nope, but it’s the only thing that worked. Please, don’t respond saying I should have been able to just “swallow a few bites of real food”. It didn’t work that way, even one or two bites of the “wet cardboard” taste and texture would just make me vomit. OMG, the people who make this kind of stuff are similar to the ones that are there behind the pizza gate and the so called new world order. People of the world, beware of these fake products coming out of USA. Truly they bring shame to that nation of people who are in general, good. But their leaders and some selfish businesses just cash on such things to kill people all over the world. It is not only a shame but it is HORROR. The article doesn’t even mention the dihydrogen monoxide in these drinks. That stuff accumulates in every cell in your body! Too much of it will kill you. Why would you joke about this topic? A lot of people out there just follow “doctor’s orders” thinking it’s good for them. My mother passed away after fighting cancer for three years. The whole time when she couldn’t eat they would push this stuff. Now I wonder if they actually rushed her to her final resting place. There’s a time for sarcasm but this is not it. 1. Not to mention of the taste of it is gross no matter what flavor you try. My husband had rectal cancer and couldn’t eat. I encouraged him to drink this and it came right out in his colostomy bag. He told me to never make him drink it again and I didn’t. Thought it would help him, but only made him worse. He died. He was only 38 yrs old. Jeanie I’m so very sorry for the loss of your husband. I was diagnosed with Stage IV Colorectal cancer in 2014 which metastasized to my liver. You are so right at one time I had a temporary illiostomy bag and was forced to drink Ensure and it went straight in the bag didn’t look like much was absorbed. It was the nastiest thing I ever tasted. I never drank it again. Did my own organic smoothies along with Isagenix shakes which kept me fairly healthy while on chemo, surgeries, and radiation. I was also told by my Oncologist not to do some of the holistic things I did to survive treatment. I have been in remission for over a year now. God bless to you and your family, and again I’m truly sorry for your loss. I will have to go read the label of the vanilla Ensure regular. My husband almost died in 2011 and Ensure is what helped him get better. He still drinks them every day and has been having gastrointestinal issues the past few months. It could be time to find something better for him. My Grandson has been on 7 chocolate small Ensures a day and 150 Calories solid food. This is for his Crohns or colitis. He is struggling with this for over 2 years. He was in the hospital and they decided to take him off solids. He hadn’t grown or gain any weight for over 2 years since he was diagnosed. The ensure is keeping him alive right now along with a bunch of shots, infusions and pills. It has been a nightmare. Now it makes me sick to read about the ensure. What is a safe proven alternative? My hubby had a terrible fall and lost around 50 lbs. The hospital had him on Ensure and I continued that at home. After being on it a couple of months he had diarrhea almost every day and could not gain weight. Our homehealth nurse suggested Carnation Instant Breakfast with whole milk. Working like a charm. He has gained about 10 lbs diarrhea is gone and he feels better and stronger. In comparing Ensure, Boost and Instant Breakfast I found that Instant Breakfast has more vitamins and protein. And it’s cheaper. Yay! This is so so scary, my family dad uncle sister drink this stuff. uncle died with cancer, dad has cancer and sister is downs, and has a large hernia in stomach with a colostomy bag and can’t have surgery. losing weight and was given this drink by nursing home to help with her weight loss … omg how could they do this to people. my heart is heavy and saddened… thank you for bringing this to the public… best to you. I had a liver transplant about a year ago. As you can imagine many trips to the hospital and hospice before, during, and after transplant. At every turn – Ensure was being pushed on me. Everyone insisted it was the best thing I could do for myself. Once I read the ingredients, I never took one drink. This article is well researched and I appreciate the information, I will share it with everyone that did not understand my motivations for wanting healthier choices!! It’s difficult being in the hospital, and having so limited choices!! Thanks again for posting this article!!! Sara Ding your comments were most helpful!!! ?? I’ve worked at a hospice for over 25 years. When people come to our facility with a life expectancy of less than 6 months, we use a pleasure diet which means they eat whatever they want. Sometimes they are well enough to eat regular foods of their choice, or they may require a modified diet such as full liquids or thick liquids. The thickened water that we get is terrible so we encourage thickened juices that we prepare. Some patients ask for Boost or Ensure products which they can get. However, we do make a lot of milkshakes or smoothies which are enjoyed more, and less stomach effects. Some people can only tolerate sips of water or a sponge dipped in water to moisten the mouth. At this stage, their disease is killing them. We offer what nutrition they want to enjoy. It really isn’t about calories or nutrition at this time. If they want chips and soda, they can have it. My mother was dying from digestive issues and Coumadin. She had severe intestinal bleeding so they removed her large intestine. She got so sick from the antibiotics and pain medication that she developed drug induced pancreatitis and could no longer eat. She went from 125 lbs to 87 lbs while in the hospital. They wanted her to drink this stuff and I just couldn’t let her, especially knowing her poor system was so poisoned already. I researched and found an organic drink, High Fuel by Organic Valley. It saved her life. Even her gastro doctor asked me about it so he could share with his other patients. It’s expensive but was worth saving my mother’s life. Two years later, she is healthier then she was 10 years ago. There are healthy options out there. It’s sad patients don’t know about them. The advertising of Ensure should be illegal. The only sodas allowed in the vending machines at the hospital are aspartame laidened diet drinks. I just don’t understand how that is allowed to happen. The best thing that you can do is to get a nutribullet or some other kind of juicer and put in combinations of organic/fresh veggies and fruit (spinach, kale, apple, banana, pear, kiwi, turmeric, almonds if not allergic to nuts, etc.). It is so delicious and nutritional. They have good recipes that come with the juicer or you can find them online. I have had these for breakfast and noticed a remarkable difference in the way that I feel. If they are organic, you are also ridding yourself of toxins. These smoothies and a tablespoon or so of apple cider vinegar – very healthy! It’s a good supplement and kept my dad heathy during his declining years. We had a hard time getting nutrients into him because he had no appetite and would refuse most food. He liked the taste of Ensure and it was key in maintaining his weight. In a perfect world I wish he would have eaten more raw vegetables and fruits, but he just couldn’t tolerate them. Ensure was a godsend. Renae, love your recommendation! Ensure is outright poison, sugar is rocket fuel to cancer. If only people would quit believing the marketing hype and take the time to really research what real food is, their lives would be transformed! I know mine was. I was sick and tired of being sick and tired, did the research, went gluten free and organic – my wife joined in too. We are in our 60’s. Most of our friends have had or are having surgery, are on multiple meds and miserable. We are drug free, both free from brain fog, active and going strong!! I work in dietary at a local hospital and the patients i take meals to are prescribed this crap, sometimes 3 a day. 🙁 It makes me sick knowing the hospital i work for is pushing chemicals disguised as nutritional supplements on the very people they claim to be helping. I wish I could thank Carrol for this great article, I am not surprised reading it today, but only a few years ago I would be shocked. Just over 2 yrs ago, I went on a journey for real answers. I learned about GMO’s, pesticides, chemical sweeteners, and vitamins. I blindly jumped on board with a friend and started using products at 40 yrs old to get healthy and have more energy. Best mistake I ever made. Since then, I found out what not to drink, eat or supplement with, but also a way to get pharmaceutical grade supplements that make me feel great. Getting my immune system back in order has kept me from getting sick, have not had a sinus infection in forever. (SEPT ’14 actually). Now, I share this information with people all the time. Education is the key to many companies out there pushing unhealthy products. Including big pharma! The makers of Ensure are wolves in sheep’s clothing. I would NEVER offer Ensure to my loved one’s, nor to my enemies. Now that they have been exposed, perhaps it will be removed from the shelves of stores nationwide. (Highly doubt it though. ) Shame on the makers of this product for making millions of $$$$ off those who are dying. Perhaps it’s time for this product to take it’s rightful place, which is to be deleted from the face of the earth! There should be a class action suit against Abbott! Its the epitome of false advertising! Even the name. I’ve worked in the food departments of hospitals and nursing homes, and they all use this garbage! I’ve known this info for quite some time… I wouldn’t feed it to my worst enemy! I have been drinking Carnation Breakfast Drinks, which are similar to Insure, for the last four years. This drink must also be bad for you, because since I started drinking it, I have developed severe stomach problems ulcers and diviticuitis. I’ve also developed an irregular heartbeat which I have to take medication for. This drink is all I can tolerate at this point. I had no idea it could cause health problems. I am getting a new food processor and making smoothies. Hopefully this will help, I’m so thankful for this article. It may have saved my life! We have been giving this to our mom who is 90 years old after she came home from the hospital because we thought it would help her get better and provide more protein. I will make sure that we find her something else to drink. Thank you for the article and all the comments! An older relative was recently diagnosed with a very fast moving terminal cancer. After not eating for a few days he was able stomach some Boost (basically ensure) and get a bit of energy and vigor back. As soon as he was able we picked up a large container of Vega One brand All In One (not protein only) shake powder (found it available at Shopper’s Drug, Bulk Barn, and cheapest so far at Costco) and a small magic bullet single shot machine (kit on sale $40 @ Canadian Tire or $50ish regular). This label looks incredible and it’s nice to be able to portion as much as you need per serving! 🙂 I found a shocking sugar-free cancer study using stevia as a replacement so I bought a big bag of the granulated stevia at our local bulk barn. I also found both pre-radiation protection & general tumor shrinkage studies about fresh ground flaxseed (plus the fiber helps stay regular). SO for his morning smoothie I would ground 3 large spoons of flaxseed into a fine powder first (if possible don’t grind ahead of time or it loses its potency. buy whole, and grind each serving), then add Unsweetened Almond Milk (high vitamin D), Vega shake powder, sometimes a spoon of natural plain Greek yogurt, and a small handful of whatever berries, sometimes half a banana (high potasium). Sometimes I’d add a pinch or 2 of raw cocoa bits or shredded unsweetened coconut. It was incredible to see the difference this morning smoothie started to make & quickly! and then he would have a tiny portion of whatever we had for supper at night (or another diy shake if he couldn’t eat). TRY IT!!!! Also, for anyone doing chemo (or without chemo too! ), a good synergistic natural addition is organic sulphur (I found a good quality one from the Happy Body Store online). Chlorine will kill all the benefit so let 2 liters in a glass pitcher sit for a few hrs to dechlorinate fully. then add about 8 tablespoons of the sulphur to the jug and stir. Let sit a few more hrs and stir again, grinding the crystals on the bottom to help dissolve. Drink as much as possible (75% to 25% orange juice helps kill the bitter flavour). It helps open all cells and oxygenate them. Because it opens abnormal cells also it will actually HELP chemo be more effective too!! Big companies only care about the bottom line. They serve Splenda on every hospital food tray and it is very dangerous. It interferes with medication absorption and metabolism. Doctors only listen to what the drug companies and food supplements companies tell them. Why drink something as horrible as Ensure when it takes only a few minutes to make a nutritional smoothie in the Vitamix or even a simple blender even with a few ingredients like milk or plain yogurt, half a banana, nut butter and cocoa beats anything that comes in a can. Add few frozen fruits and vegetables such as blueberries, spinach, kale an quarter of an orange and you have something much better. Make a chicken or beef soup with some healthy vegetable blended in it, it’s so much better. You want to provide nutrition not chemicals. I get so upset when nutritionists offer these harmful products to patients. They should know better. Whey Protein isolate contains a large dose of MSG!! It is created when the curds are separated from the Whey. The fact that it is concentrated means they give you a larger dose of MSG. They know this. Corn syrup solids can contain MSG too!! My mom a senior citizen on a fixed income and victim to FS cut backs bought out 3 cases of … well let’s just say Slim-down-fast shakes at a local food pantry for the needy. She lived on them for about 2 weeks before she started to show signs of a serious heath problem … paramedics came and took my incoherent lethargic mom to the hospital where she was admitted … they could not get straight answers from her as she really was out of the loop and not making sense. We finally figured out that she was living off of 25 cents a can expired by 2 months diet shakes/meal replacements! Almost killed herself! Irony is that 1 week later while she was just starting to come back from the brinks of death guess what they brought her … Yup, ENSURE!! I just can’t imagine what devious soulless scabs would even put this on the list to give the very vulnerable members of our society and call it food … sad sad sad and very MAD! 8 years as a hospice nurse I never encouraged this crap, BUT families and patients are hard to educate about nutrition. We are taught if you eat you’ll feel better, you’ll live longer, if you eat you must be OK, etc, etc…thanks for the info, it needs to get out there !!! Hi Sara, this is a very noble initiative you have involved yourself in. I connected with a company called Juice PLUS+ in January this year, you may have heard of them, whose mission is “Inspiring Healthy Living Around The World”, because I have a passion to help people liver a healthier lifestyle. I’m a nurse and am a current ICU nurse. I worked in the ER for several years as well. Ensure, as bad as it may be, is not intended to be a long term supplement -at least not from the inpatient side. Patients require calories to heal, the body needs fuel, and sick people usually don’t have an appetite. That being said, ensure is better than a feeding tube. A feeding tube is just another way to introduce bacteria to the patient, it’s a foreign body. The medical world may not be perfect, sometimes the treatments can have long term effects. Pharmaceuticals are the same thing… you take one medication to treat an ailment which in tern causes side effects that require another medication. I’m sorry for the loss, and this post is in no way a nasty response, it is simply someone giving you the other side of the story. I’m not condoning artificial ingredients but most of us consume toxins in multiple different ways, causing the cancer in the first place. Thank you for writing this out! I am a healthcare aide, and while we don’t get the extensive training and knowledge that nurses do, this is still very important to say. Healthcare does not get a lot of funding where I’m from, so fresh fruit is limited, and time to make smoothies is even more limited. People don’t realize how hard it is to watch someone die over the course of months. Yes, Ensure may have horrible ingredients, but I’d rather my patients stay at a decent weight than tell them: “Sorry, ensure has bad stuff in it, so you don’t get anything to consume today.” Don’t get me wrong, I realize NOW how bad Ensure is, but I still would never refuse to abide by someone’s request. My job as a healthcare aide is literally to prolong life. It’s in my job description, and that’s what I learned in my studies. The medical world is constantly changing to meet the demands of new studies, no one knows everything about the body so we are always learning and switching things around as we learn new things. I’m sorry for those who lost family … Deepest sympathies. It kept my husband alive for an entire year when he was on a feeding tube and could not swallow food at all….even water. We never thought he was getting the same nutrition as he would from food, but he got enough calories to keep him alive. Today, a year later….his feeding tube is gone and he eats everything. My Mom Loves Ensure Butter pecan she is 90. My Dad limits her to 1per day I have to let them know how bad this stuff is. The rule of thumb for everyone ought to be: If the list of ingredients on your food item looks like the periodic table of the elements, don’t buy it. Following chemotherapy, surgery and more chemotherapy for gastroesphageal cancer, I was encouraged by my dietician and nurses to drink Ensure. The stuff was drinkable but way too expensive. And now I see that it is not good for us over the long term. You opened my eyes. My mom was put on Ensure when she was in hospice. It was the end and probably wouldn’t have made much difference unfortunately. My doctors recommended it to me after my major surgery and I never realized what I was putting in my body. The good thing there was it was very short term and I didn’t like the taste so I stopped it. I will never use it again! 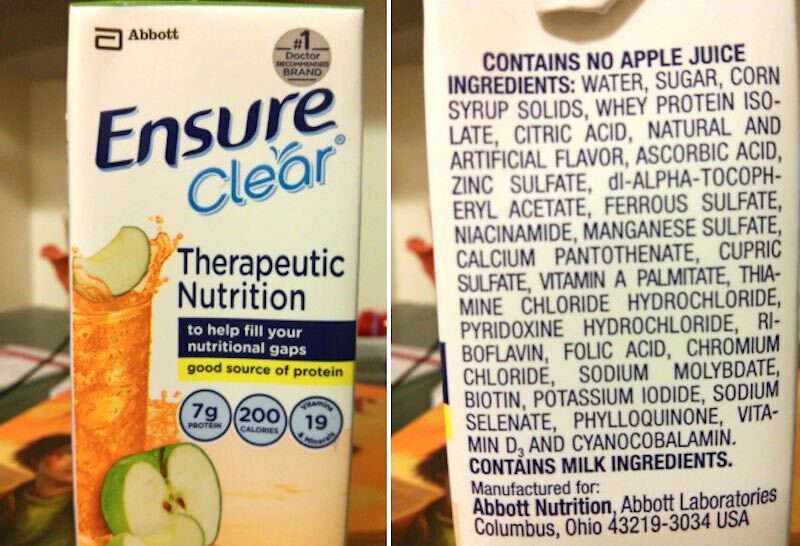 My husband was told to drink this when the doctors thought he had cancer in his colon, which by the way turned out not to be cancer. But he was losing weight and couldn’t keep anything down. He said this stuff made him sicker and he threw it up. After I found this article and read it to him, he later told me he could not even drink the stuff because it made him sick. I believe in smoothies with all natural ingredients if you want to get better and stay better. When my son, Hayden, was 3 yrs old he had a drowning accident which left him with a severe Anoxic Brain Injury. While in the hospital, before he received his G/J tube, he went from 38 lbs down to 28 lbs. Once they placed his feeding tube, they began to give him PediaSure or Nutragen Junior as his daily meals. In about 6 months’ time he gained weight up to a whopping 55 pounds and started having a lot of digestive problems along with a major increase in his seizure activities. Being the very mindful mother I am, I decided enough was enough and I took my son off all “artificial nutrient meals” and started him on a very strict vegan blenderized diet where I bought everything fresh from the market, brought them home, put them in the blender and got it as close to liquefied as I could in order for it to go into his feeding tube without clogging it up. That was 2.5 yrs ago and there is not one day that goes by that I regret my decision to never again feed my child that crap. Hayden has recovered by leaps and bounds since giving him REAL FOOD. I thank the Lord everyday for providing us with all that we need here on Earth right at our fingertips, grown from plants, trees, vines and soil which He provided. There are so many wonderful sources of nutrition all around us and therefore, there is no reason anyone should ever subject themselves or a loved one to the artificial crap they call “nutrition”. This is what they gave me when they made me do the gallbladder test because they were out of the ordinary stuff, they refused to retest me, took them two years but yep, they talked me out of a completely healthy organ, weight immediately crashed from 155 to 120 on a 5’11” adult male, yeah they sure got that diagnosis right the first time, then immediately alienated me afterwards, almost blew my brains out when my pain/symptoms went from bad to horrific post operation. I had colon surgery and was fed all this stuff. I knew it was crap and made me feel even worse every day . I insisted by doctor order me some real food and he did. It was the turning point in my recovery. My doctor told me I needed extra protein, so I started to drink the Wal-Mart generic Ensure. My best friend sent me this article and opened my eyes!!! That is why she is my BEST FRIEND!!! I’m so glad someone is exposing this marketing con. A variation of Ensure is used in hospitals to tube feed people who can not eat. It is not the same as the commercial over the counter product. A marketing person decided to try to and expand the hospital market into the consumer market, he succeeded. However, the product was severely compromised and any good dietitian will offer solutions that are much cheaper and healthier than Ensure. Ensure is a marketing con. Read the labels. The top ingredient in Ensure is WATER. This is followed by Corn Syrup. Do I really have to say more? If a person needs added vitamins they are much better off with a 8 oz glass of milk and a multi-vitamin. This is about 1/10th the cost of bottle of Ensure. If an person needs calories, a shake or smoothie will do far more good than this crap. Ensure is NOT good for you. It is loaded with chemicals to provide shelf stability on the store shelves. Abbott promotes this product for use to enhance and “maintain an active lifestyle”. This is a bunch of marketing gobbly goop. How do you dis-prove this slogan? Fact is, you can’t. This is why they use it. The product is an absolute waste of money. And, it gets more expensive as Abbott increases the price 2-5% year after year to help grow the corporate profits. They do this even when the cost of the ingredients haven’t increased. Abbott profit margins on Ensure are well above the 60% range. I would expect them to be closer to 70% or 80%. This is pure corporate greed at its finest. Abbott now feeds Ensure to Children by calling it PediaSure. Abbott was successful in getting PediaSure approved by the federally funded W.I.C. program. So, American tax dollars are now paying for this crap to be fed to children. This is so sad. However, this is a political hot button. Which representative would like to be labeled as the person voting to take “nutrition away from children”? This is how Abbott would lobby against loosing this massive new piece of business. How do I know this? I spent almost 20 years working at Abbott selling Ensure. This is not something I am proud of. This is one person’s opinion. My mom has been on Ensure for 8 years as it is the only thing we can get down her. the Plus has 360 calories so she is getting 1100 calories a day. The Dr has even taken her off the multivitamin as this has all the vitamins that she needs and she is holding her weight. Of course there are preservatives and other chemicals in the bottle so it will stay shelf stable and safe over the long term. When they tried to get her to eat short term in a rehab from a broken hip, she went down to 101 pounds, now with the Ensure she is back to 122 at 85 years old. Doesn’t seem like one person …. I started on the shakes and after five days I had severe stomach problems. I thought I was having a heart attack … went up into my chest and gave me chest pains … after a week off it I am finally feeling better but not perfect. Went to the emergency because the pain was so bad. When speaking with a breast cancer survivor, she said she too had similar pain when taking it during her recovery. They gave her other medication to coat her esophagus and stomach so it wouldn’t damage it. Three months of hell for her … mix your own shakes with real food. Stop taking this poison! I was diagnosed 9 years ago with stage 3c ovarian cancer. Had a blockage about a month after surgery and was on an iv for 2 weeks. No food. Had more surgery and then between surgery and chemo just could not eat. I needed to gain weight quickly because i knew if i had anymore setbacks i did not have the strength and weight to get through them. I drank several ensures a day and was able to finish treatment. Slowly i got back to eating normally. I am alive and healthy 9 years later (statistically i wasn’t supposed to be) and am very glad i did everything i could including ensure to stay alive!!! It is very easy for people to judge when they are not in that life and death situation!